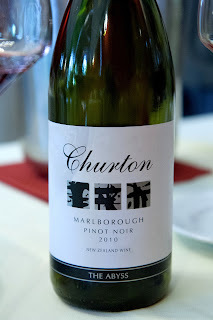 Churton winery from Marlborough. 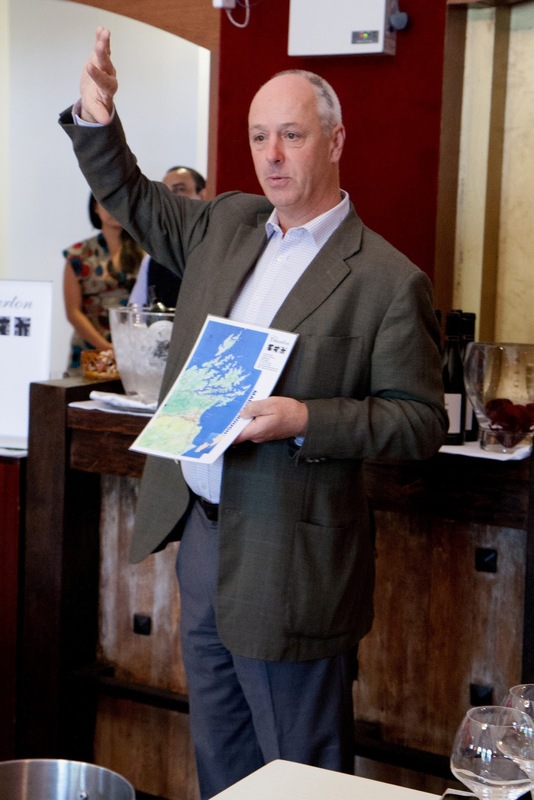 Sam Weaver (owner and winemaker of Churton wines) swung by Singapore 2 days ago to introduce his wines to a roomful of sommeliers and tradespeople. The Singapore office of Berry Bros and Rudd organized this event and it was held at Buyan Restaurant & Caviar Bar. Sam comes off as a passionate man; passionate about the wine he produces, passionate about the art and science of wine making, passionate about viticulture and very strongly passionate about treating the land right. He knows his trade and during the masterclass he enthusiastically shared his knowledge and experience on grape growing, wine making and respecting the land which provides the harvest. In the wines he produce, he tends to strive for three elements (often mentioned during the course of this masterclass): 'fruit weight' in the wine, 'layers of flavour' within the body of his wine and a 'lasting finish'. His grape growing and wine making endeavours seem to be directed towards yielding these 3 qualities within his wines. Towards this end, he has gone on to do things a little differently from most other Marlborough wineries. Unlike most wineries in Marlborough which locate themselves in the valley floor, Sam situated his vineyard (22 and a half hectares in size) on a hill (upon a ridge which has a north east facing). This elevated site provides soil composition a little different from that found in the valley floor. It also helps to avoid excessive exposure to cold air (which has a tendency to sink to the valley floor) at night. Likewise, rather than adopt the practice of winemakers who buy grapes from other vineyards to produce wine, Sam only uses grapes grown in his own vineyard.This ensures the quality and health of grapes from the time they are grown until they are harvested and transported for wine production. Other initiatives like green harvesting, restricting yield per hectare, hand harvesting most of the grapes and managing the vineyard organically (and biodynamically) all add up toward producing good grapes in a sustainable manner. 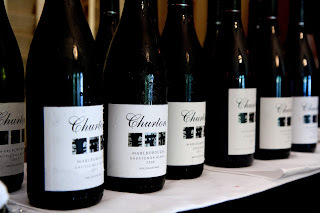 The Churton SBs showed differently compared to other SBs from Marlborough. You don't get that upfront 'passionfruit, goosebery, cat's pee, capsicum, cut grass' aromas easily identifiable with Marlborough SBs. The 2009 and 2011 both convey citrus and grapefruit aromas (mildly I must add; nothing upfront or showy on the nose) with the 2011 vintage having an additional floral aroma. The palate shows the 'fruit-weight' which Sam mentioned. Leaving the wine on the lees, oak aging a portion of the wine and allowing for bottle aging all have contributed to these wines gaining depth and complexity witnessed in the palate. (This is certainly atypical when compared with the production methods of other SBs in Marlborough; though as an exception, to an extent, Cloudy Bay's Te Koko comes to mind). This is Churton's second vintage for a Viognier. Aromas sway more towards floral in nature (though subtle), medium plus body and not 'oily' in texture (as most viogniers are known for). A couple more vintages should see this varietal show itself better. The 2007 vintage showed ample cherry and earth flavours with medium intensity in its palate but somehow lacked the silky texture and integrated body displayed by both the 2009 and 2010 vintages. The 2009 (apart from cherry notes) also carried a lovely floral aroma and a hint of muskiness. The body is soft and elegant with cherry, earth and spice flavours at play in the palate. Like wise, the 2010 vintage showed itself well in aroma, flavours and texture, something like the 2009 but a stronger and bolder wine. The 2010 will do well with food. All three wines provided a long finish. 'The Abyss' is produced in exceptional years when the fruit quality justifies its production. The fruits for this wine comes from a particular parcel of land located on the hill slope north east facing in nature. Its Sam's opinion that this site is the most favourable place for growing high quality pinot noir within his vineyard. The 2010 Abyss shows aromas of black cherry and floral notes (though muted); it has a medium plus body which impresses with fruit concentration rather than expression of flavours for now. Still some way to mature before expressing itself I suspect.